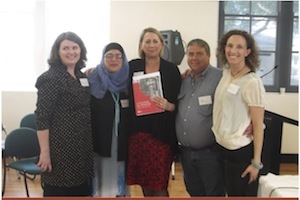 A new book celebrating the stories of a diverse range of adult learners from around Australia was launched in Sydney in April. Lifelong & Lifewide: Stories of Adults Learning was launched by the Hon. Sharon Bird, MP and Minister for Higher Education and Skills at Sydney Community College on April 17. As part of the event, a panel including two of the learners featured in the book, Sahar Elsemary and Mick Goss, Professor Barry Golding (President Adult Learning Australia) and Garry Trainor (Sydney Community College) and the Hon Sharon Bird, MP, shared their views and experiences of adult learning. The book’s author, Ilka Tampke, was commissioned to write the book by ALA CEO Sally Thompson. ‘Her vision was to create a book that could bring a human face and personal stories to the diverse policy areas of ALA’, Ilka says. And that meant hitting the road. Ilka travelled to most states in Australia, conducting both face-to-face and phone interviews in her quest to ‘unearth the rich stories’ of people’s experiences of adult education. The result is a series of 10 intimate portraits of a diverse range of people whose lives have been enriched and transformed by finding the right place to learn. Lifelong & Lifewide: Stories of Adults Learning is available for $15.95 plus $4.95 postage.